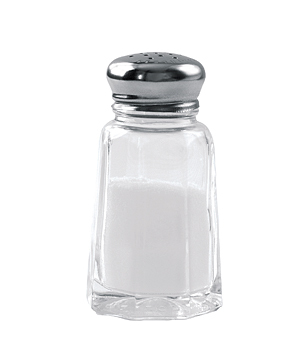 Obviously, this whole “salting” thing from The Bos has got me hopping mad — and for good reason. By implying that the sites were “salted,” The Bos raises the issue of fraud or conspiracy surrounding the modern date he got on his YDB carbon spherule from Gainey, Michigan. But there’s a problem with that accusation — the YDB group published a modern date of the same Gainey site four years ago (Firestone, 2009). In that publication, Firestone speculated about several possibilities for the unusual date. Carbon spherules were rarely the source of the dates to my knowledge. From the beggining the approach was to test sites that had already been dated and well accepted, so the body of research includes plenty of dates — from hundreds of researchers — that confirm the 12,900-year-old age of the YDB layer at nearly 30 sites around the world. Carbon spherules from the Carolina Bays and Gainey were radiocarbon dated at the Keck Carbon Cycle AMS Facility at UC Irvine. These dates, summarized in Table 3, vary from 275 yr BP to 755 yr in the future and are inconsistent with their age inferred by the stratigraphy of the samples, strongly suggesting that the carbon spherules are enriched by a factor of »5 in 14C. No natural process is known to enrich carbon in 14C that much. It has been suggested that hydrogen in the comet might undergo a D+D fusion process on impact producing neutrons that would make 14C in the atmosphere (Brown and Hughes, 1977; Kim, 2008), but this seems unlikely unless the comet’s velocity were extraordinary (D’Alessio and Harms, 1988). …The Younger Dryas impact layer from 13 ka ago shows an unusual chemistry. 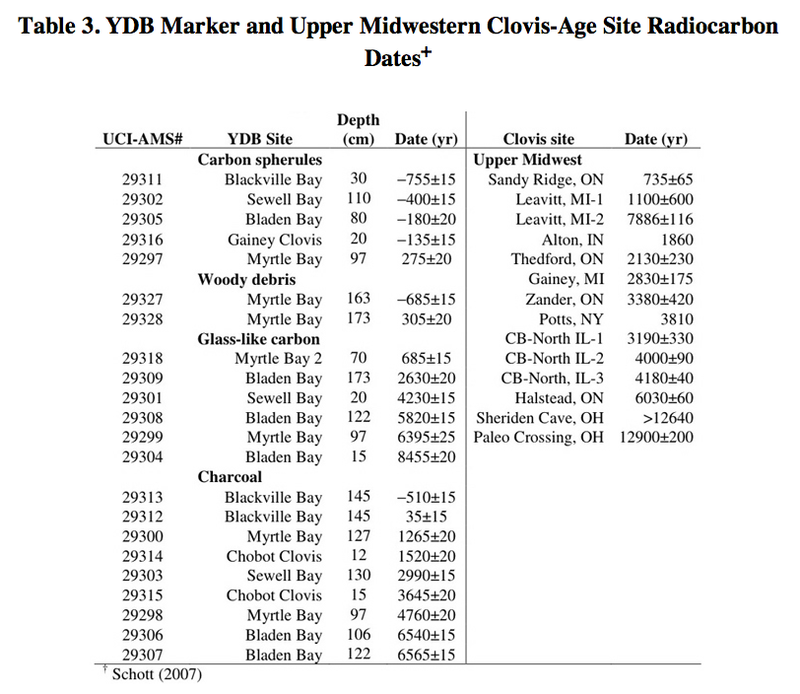 Radiocarbon analysis of carbon spherules from the YD impact layer at Gainey and various Carolina Bays yields future dates despite their stratigraphy. Charcoal from Chobot and the Carolina Bays date to <6000 yr BP a common characteristic of Paleo-Indian radiocarbon dates at Northern sites. The radiocarbon record shows a sudden increase in global radiocarbon at the time of the YD impact with a signature different from the near Earth SNe. There is no mechanism for the injection of excess radiocarbon into an impact layer unless the impacting object came directly from a recent, nearby SN where 14C is predicted to be produced at 107 times terrestrial abundance. Near Earth SNe (<300 pc) are expected every ~15 ka, and at least two nearby giant stars Betelgeuse (132 pc) and Antares (190 pc) are near the end of their lives and likely to go SN in the near future. And so, let’s sum up. According to The Bos’ claim, the YDB group salted the site with modern spherules, then dated the salted spherules, then published the modern dates of the salted spherules — in order to alert the world to the fact that they salted the site, right? This nonsense is simply proof that The Bos doesn’t to read the YDB papers. He’s already concluded that the idea is “bogus” and doesn’t need to be bothered by pesky facts and publications. If someone should be fighting accusations of improper science, it is The Bos. Selectively ignoring evidence you don’t like is not science at all – it’s politics.